The Pens may win the Eastern Conference final, but first, they have to survive it. May. 16, 2017, 6:00 a.m. The term ‘next man up’ has become such a tired cliché in sports. And yet for the Penguins this postseason, it’s become a necessity. Nobody on the ice Monday night wanted to be the ‘next man up’ in a game as important as that. Sure, for a young player not expected to get many minutes — or even dress for the game — getting a chance to play in the Eastern Conference final is an unexpected thrill. But the circumstances for the next man to step up have become, well, ridiculous. The Pittsburgh Penguins shutout the Ottawa Senators 1-0 Monday night with their backup goalie, missing two key wingers and, for much of the game, probably their three best defensemen. Pittsburgh played most of Game 2 with just 11 forwards and five defensemen and not only did they win, they allowed just 23 shots, 22 of which made it to Marc-Andre Fleury. None, again, went past him. Of all the wins this season, Monday’s may be the most remarkable, if only for who was left on the ice to celebrate. Phil Kessel scored the game winner late in the third period to tie the series at one game apiece. Kessel said after the game, via NHL.com, he knows how much this group has been through this postseason. Kessel’s game-winning tally was inexplicably huge for Pittsburgh, as going down 2-0 in a series after losing two games at home is nearly impossible to salvage. (Just ask Washington.) But the win means even more to Pittsburgh now, given just how many darn injuries they seem to keep getting. The Penguins may still win this series, but first, they have to survive it. Conor Sheary, who himself was concussed in the previous series, was angling toward being a healthy scratch before Patric Hornqvist was deemed unable to play during warmups. Sheary then was forced to move from the third line back up to the first after Bryan Rust had his head scrambled by a (legal) hit from Dion Phaneuf early in the game. Technically, Rust left with an ‘undisclosed injury’ because the NHL decided long ago it cares more about gamesmanship than truthfulness. But, I mean, come on, we all have eyes. Hornqvist, himself, was out with an ‘undisclosed injury’ the Penguins wouldn’t even discuss after the game, so he could either have a hangnail on his pinkie toe or he may have lost an eye and he was out being fitted with a bionic eye for the rest of the playoffs so he had to miss Game 2 because that’s the only time the local bionic eye doctor could see him. Reports before the game indicated the Pens could also have been without Carl Hagelin, who did return for Game 2 after what head coach Mike Sullivan told reporters was “several minor injuries.” That had people suspecting he was benched, again, because the NHL would rather funnel out false information about player health and safety than in any way give the opponent a target to aim for on the ice. Hagelin saw 11:16 of ice time Monday, if only out of necessity. Rust logged just 1:43 of ice time before being unable to continue, which was 2 minutes and 57 seconds less than Justin Schultz, who was knocked hard into the boards and skated off the ice in the first period as well. Schultz looked to have a shoulder injury by the way he went into the boards, and the way his arm hung as he skated off the ice. But, you know, this is the NHL, so he’ll be listed only as having an ‘upper body injury’ which could mean a separated shoulder, a bone bruise or a ruptured ear drum from that awful ‘Let’s Go Pens’ air horn. It’s definitely one of those. Jokes aside (seriously that air horn is terrible), losing Schultz for a long period of time might be too much for the Penguins to overcome. Losing Schultz and Rust and Hornqvist and Matt Murray and Sheary for a bit and Sidney Crosby for a while and Hagelin if you believe that was injury-related and Trevor Daley and Kris Letang before the playoffs began is, in a word, ridiculous. The Pens have been able to survive without Letang. Surviving without Letang and Schultz is not an option. Schultz had 51 points for the Penguins this season, leading all defensemen. He was a plus-27 in 78 games, best on the team, logging nearly 1600 minutes of ice time, 10 minutes fewer than Ian Cole for the most on the team, though he played in two fewer games. His average ice time of 20:27 this season trailed only Brian Dumoulin and Letang this season, and yes, if you’ve read our coverage of the Penguins enough, you knew all roads were going to lead back to Letang at some point. Pittsburgh has been playing without Letang the entire playoff run. They’ve played the first two games of the Ottawa series without Daley on the back line as well, and then played all but a few minutes of Game 2 without Schultz. The result? Tired legs. And another shutout. Cole logged 20:20 of ice time, while Chad Ruhwedel logged 21:25, which was four minutes more than his season average. Olli Maatta logged 22:33 minutes, four and a half minutes more than he averaged in the regular season. 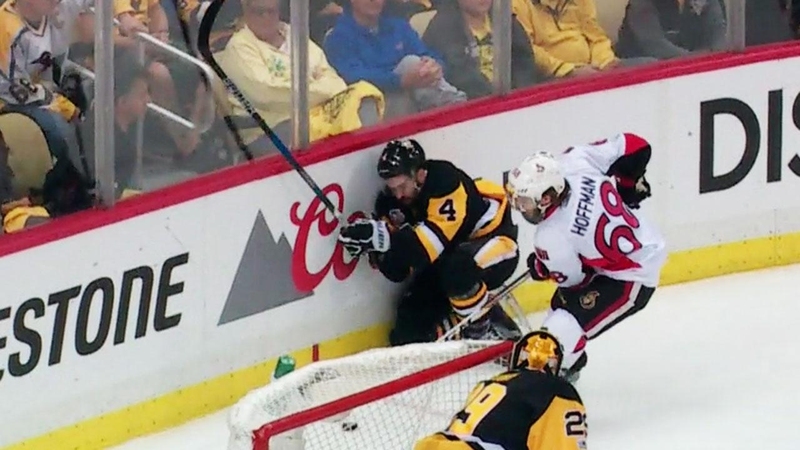 Ron Hainsey was getting 21 minutes in the 16 games he played since coming over via trade and, Monday night, he logged nearly 25 minutes on the ice, which trailed only Dumoulin, who had 26:08 of ice time in Game 2, nearly five and a half minutes more than his season average. Marc-Andre Fleury pitched another shutout Monday night. Again, it cannot be overstated that not only did the Penguins win with just five defensemen, missing three of their best, but they also did it with Fleury in net, spelling Matt Murray since he got injured during warmups of the first playoff game this season at a Conn Smythe-level caliber this postseason. So, yes, not only did five defensemen and 11 forwards in front of Fleury hang on to beat Ottawa’s frustrating-as-heck neutral zone trap, the game was a shutout! (To be fair, something about the way Ottawa plays seems allergic to trying to score goals.) Still, Pittsburgh is just about half a team right now, Crosby is still riding a pointless streak, they have no idea who will be on defense at this point and they managed to even this series at 1-1. Maybe it didn’t matter in Game 2, but over a seven-game series it will have to. And yet, we said that time and time again about Letang being out. And we said it when Murray went down. And we said it when Crosby missed almost all of two games with a concussion against Washington. And here we are in a 1-1 series with Ottawa, with almost as many injured regulars as healthy, and the Penguins finding a way to survive.